We have suddenly had a massive heatwave here in England, the weather is beautiful but it is boiling! Keeping yourself cool in this kind of heat is hard, but when you have a baby you’ve got to try and keep you both cool! The past 3 days as it’s got hotter, I’ve basically had Oliver in just a nappy all day. He’s a hot baby anyway so in the heat we are having he is boiling all of the time! It makes me laugh, we moan for ages that it’s not hot enough, but as soon as it heats up we end up moaning that it’s too hot! 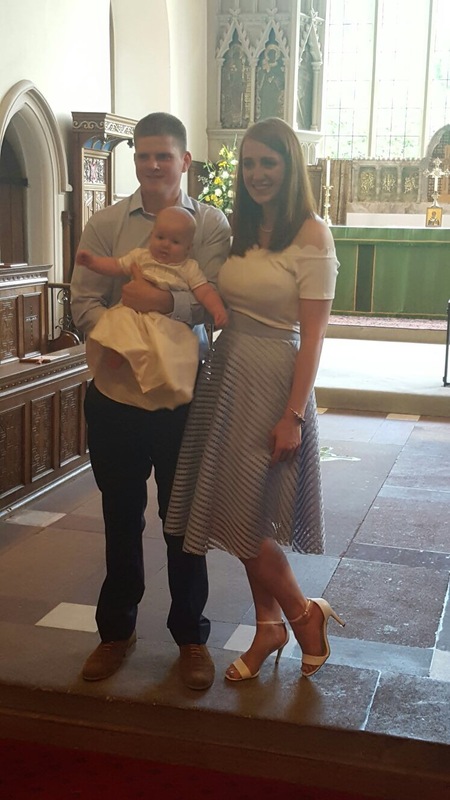 We had Oliver’s baptism on Sunday, the weather was lovely, but a little muggy, we kept him in a vest all morning, until we went to the church where he got changed into his gown. The church was lovely and cool, but when we left we were back in the heat again and we quickly got him out of his gown. I had a lovely romper to change him into at home for his party, but it was far too hot for that so I decided to leave him in just his nappy. He was very happy, he loves being ‘naked’ and everyone loves seeing a little baby with nothing on, all the lovely little rolls! 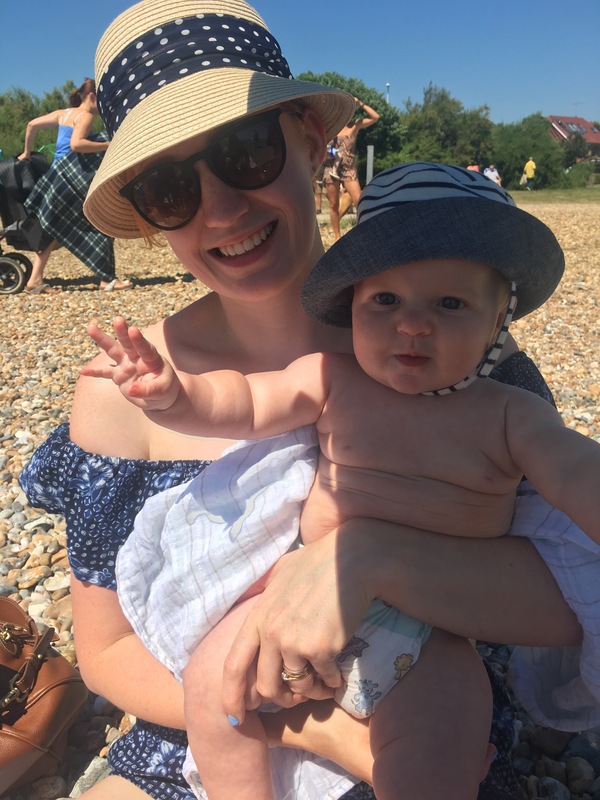 On Monday it was even hotter, about 29C, I popped him in a romper to go up to my mums, but by the time I got there he was boiling and grumpy, so I stripped him back down to his nappy and he was much happier. 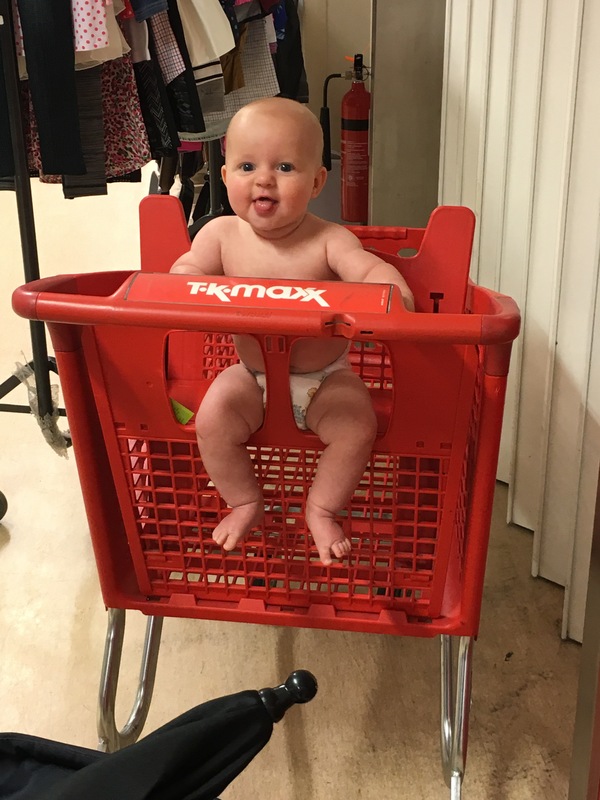 We went out shopping and all the shop assistants were laughing at the fact he was just in a nappy! The worst thing is that he always decides he wants to be carried when we’re out, he’s baking, I’m baking and I’ve then got to carry around a hot sweaty baby. I’ve learnt that if I pop a giant muslin over my arm I can use it as a bit of a barrier between us to try and stop us getting so hot together! 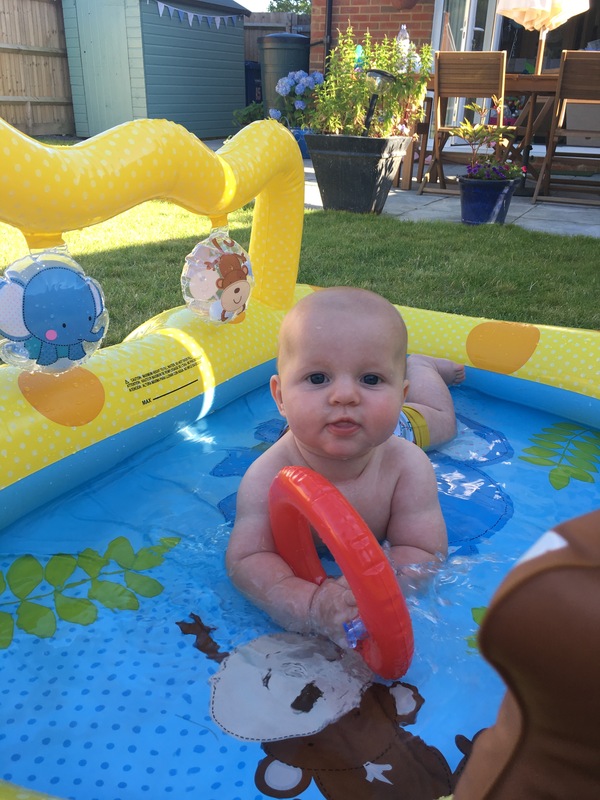 When we got home I got his new paddling pool out and thought we would use it for the first time. We filled it with some lukewarm water, changed him into his reusable swim nappy and I paddled his feet in it. I sat him down in the water and he started howling, I tried lying him on his back and he was still unhappy, so after a minute when he didn’t stop crying we got him out. Once he had calmed down I thought he could try again, this time I lay him on his tummy and he LOVED it! Because the base is all slippery he can manoeuvre himself around on his tummy which he loves. He kept dunking his mouth in the water and licking the water as well! It really helped cool him down. Today it has been so hot, about 32C, and we went down to the seaside which was lovely. The sea breeze definitely helped keep us cool and I made sure Oliver was always shaded under his parasol, even though that means that you have to keep moving it about every time you turn a corner! 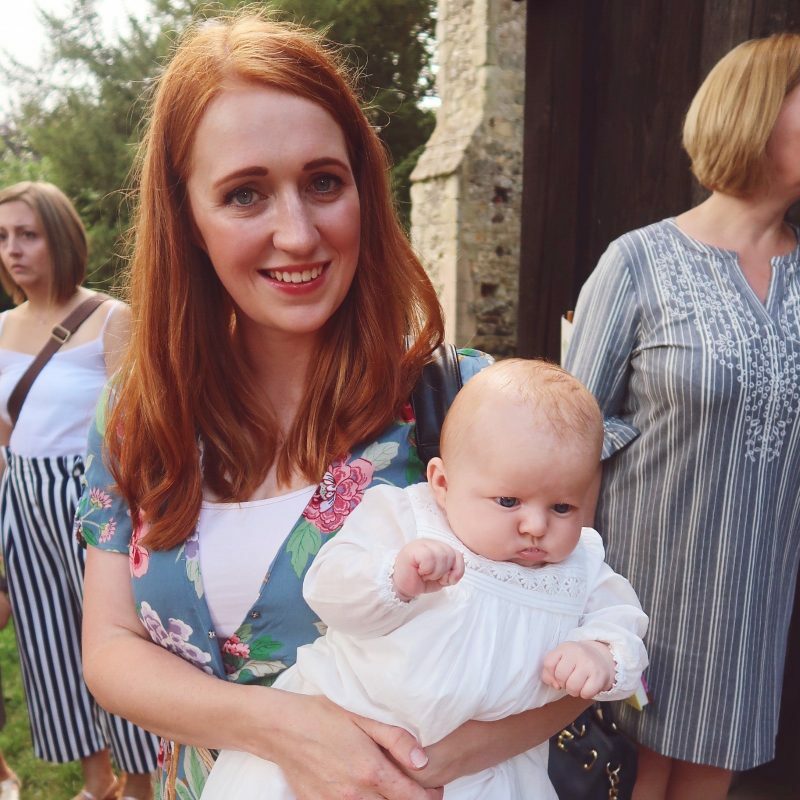 You shouldn’t use anything other than the sun hood or a parasol to cover your pram as it just makes it into a little sauna under there, and a hot baby is never a happy one. I also lay him on a muslin, as the pushchair is dark and I thought it would be much to hot too lie on once it had been in the sun and probably would make him even more hot and sweaty. I was with my mum and sister and we went for a little walk along the seafront, Oliver slept for nearly the whole walk. The heat makes me sleepy, so I’m sure that’s what helped him. When we got home we got Oliver back into his little pool and he loved it. 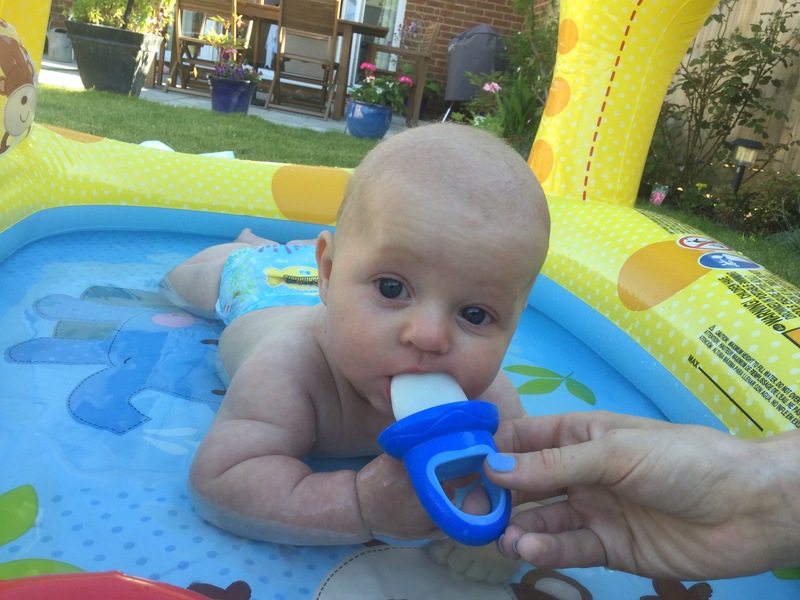 We were sat there eating ice lollies and he kept staring longingly at them, luckily I had made some breast milk ice lollies for him using the Nuby ice lolly mould a few weeks ago to help soothe his teething gums. I went and got him one out and boy did he love it! He kept grabbing it and pushing it back in his mouth. He was chewing at it loads as I think his teeth are really bothering him at the moment. I would definitely recommend making milk ice lollies to keep them cool in the heat, just put some expressed milk in the mould and freeze. I’m guessing it would work the same for formula too. He’s now currently sleeping in his nappy, I will put a vest on later of the temperature drops, but it said it was going to stay about 20C overnight and our bedroom is currently 28C at 10pm. How do you keep your babies cool in the heat? Any tips or tricks? Previous Post My little boy is already 5 months old!